Beautifully crafted with delicate shaping, this transitional wall mirror delivers artistic appeal to a living space. From Uttermost comes a tasteful wall mirror with a Moroccan inspiration. Its shaped frame is hand-crafted from hammered iron and given a lightly antiqued metallic gold finish. 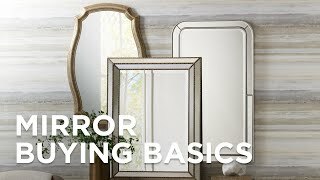 Hang this transitional wall mirror horizontally or vertically to suit your style. 23 3/4" wide x 39 1/4" high x 3/4" deep. Hang weight is 14 lbs. Glass only section is 21 1/4" wide x 36" high x 1/4" deep. Surrounding frame is 3/4" wide. 4mm thick mirror glass. Transitional wall mirror from the Uttermost Zina Mirror collection. Can be installed vertically or horizontally. Sawtooth hanger with anchors and screws pack included. Lightly antiqued metallic gold finish. Hand-crafted from hammered iron frame construction.